Enterprise software today is at the helm of the modern business world. In this scenario, the ability to develop quality software quickly is the real differentiator for an enterprise. DevOps excels as an arsenal for enterprises to outdo their competitors by capitalizing on the market opportunities through effective software delivery. As DevOps brings synergy, by breaking the silos between development and operations teams, software development issues are resolved in a time efficient manner. As the saying goes, “DevOps is a culture” and enterprises are trying hard to embrace this new culture as they strive to deliver seamless digital experience to their customers. 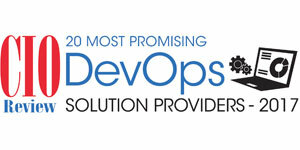 Few concerns, however, still plague the adoption of a comprehensive DevOps strategy. Lack of experience perturbs organizations the most. Having DevOps as an approach encompassing holistic practices related to code and software architecture development, vendors have developed unique methodologies to derive greater insights. These insights are driving enterprises to introduce inventive practices such as enabling microservices within containers and building a modular architecture that supports the momentum of code development and subsequent product release. DevOps solution providers are also efficaciously tackling associated security risks and cumbersomeness of postrelease bug fixing. The DevOps landscape is witnessing consistent influx of myriad solutions and choosing the most suitable out of these remains a tough task for a CIO. In the last few months, a distinguished selection panel, comprising CEOs, CIOs, VCs, industry analysts and the editorial board of CIOReview has reviewed the top companies among the DevOps solution providers, and shortlisted the ones who have exhibited expertise in solving the impediments in software development. We present to you CIOReview’s 20 Most Promising DevOps Solution Providers 2017.